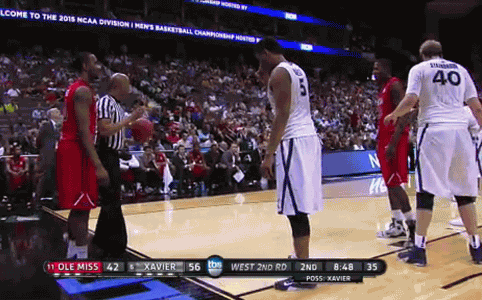 Here are some more pretty good baseline out-of-bounds plays. O1 curls all the way around the stack first looking for the pass and lay-up, and clears to the opposite short corner if no pass occurs. O2 delays slightly after O1, and curls around the stack also, cutting to the ball-side short corner, looking for the pass and shot. After the O1 and O2 cut, O4 slides around O5 into the paint, and O5 then moves out to the point. 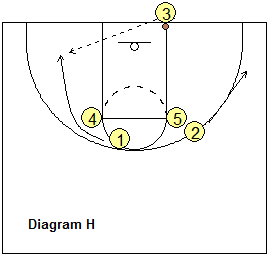 If the pass goes to the point (O5), O3 should slip into the opposite low post for the quick pass back from O5. 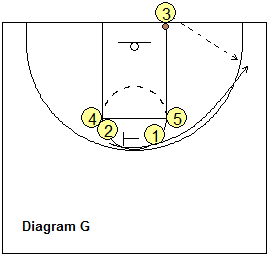 Out-of-Bounds Play "Wheel and Back"
After running "Wheel" a couple times, run this play. O1 cuts as usual. O2 fakes the curl-cut, and then makes a quick back-cut to the hoop, looking for the pass and lay-up. 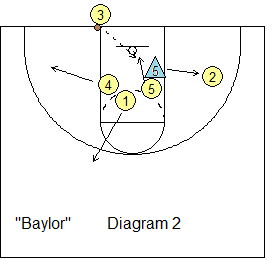 This baseline OB play uses a 3-low set (see diagrams). O4 sets a back-screen for O1. If the defense fails to switch the backscreen, O1 gets the pass for the lay-up. If the defense switches the screen, O4 seals the smaller X1 defender and rolls to the hoop for the pass and lay-up. O2 cuts to the corner and could shoot the 3-pointer. O3 moves out on top as our safety. 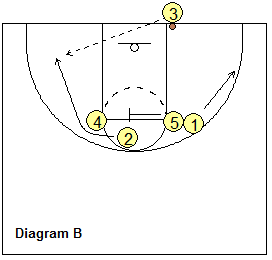 Out-of-Bounds Play "Down & Back"
After running "3-Down" successfully a couple times, then run "Down & Back". This time, O4 again takes a few steps up the paint and looks like he/she is going to set the back-screen. Instead, O4 makes a quick cut back to the ball for the pass and lay-up. Contributed by: Coach Ken Sartini (aka "Coach Sar"), Arlington Hts, IL. 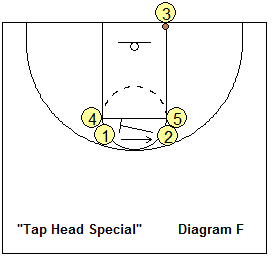 This plays starts out as a "screen the screener" play, which you can run against both man-to-man and zone defenses. Diagram A. O1 splits out to the ball-side wing. O2 fakes and cuts over O4's screen near the ball-side elbow, and goes to the ball-side corner. Meanwhile O5 screens for O4 (diagram B). O4 cuts around the screen looking for the pass and lay-up. O5 seals the screened defender and rolls to the hoop, looking for the pass and lay-up. If neither O4 or O5 is open, the pass goes into the corner to O2 (Diagram C). O2 passes out to O1. Meanwhile, O3 steps inbounds and screens for O2. O4 and O5 also set staggered screens for O2. O2 cuts along the baseline to the opposite corner, looking for the pass from O1. O2 can shoot the outside shot, or pass to O4 posting up on the low block. If the defense is in a zone, you can run it a little differently. Set up the play and run it exactly the same as in Diagrams A and B above. Now refer to Diagram D below. Assuming O4 and O5 are not open for the inbounds pass, O3 passes to O2 in the corner. O3 then cuts hard to the weak-side and screens the backside of the zone, which should be overloaded on the ball-side. 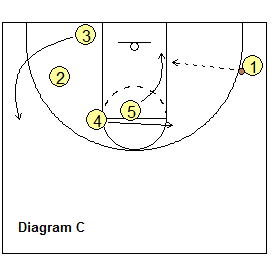 O2 passes to O1 and cuts along the baseline, getting screens from O4 and O5 and cuts outside of O3, looking for the pass from O1 and the shot. Another option is seen in Diagram E. Again the inbounds pass goes to O2 and O3 cuts to the opposite wing, receives the pass from O1, and passes into O4 posting up on the low block. Still another option is seen in Diagram F. This time O2, after passing out to O1, down-screens for O3, who cuts to the corner for the pass back from O1 and the 3-point shot. 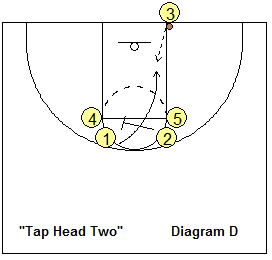 O2 cuts to the weak-side as seen previously in Diagram E.
Out-of-Bounds Plays, "Tap Head Series"
The Tap Head Series comes from coach Mike Fratello (see video below). Coach Fratello reminds coaches that the action should start as soon as the official hands the ball to the inbounder. Having the inbounder slap the ball to start the play loses a second. See diagram A below. O5 and O4 line-up on the elbows (or just outside). O2 and O1 set up behind O5 and O4 respectively. O1 and O2 use O4 and O5 as screeners. O2 lateral screens for O1. O1 cuts over the screen and rubs around O5 and may be open for the pass and shot on the right wing area. After screening for O1, O2 rubs around O4's screen (diagram B) and could get the pass and shot on the left side. After passing inbounds, O3 clears out to the left perimeter area. After O1 and O2 cut, O5 lateral screens for O4 (diagram C). O4 cuts over to the elbow (or above) area, while O5 seals the screened defender and cuts down the lane for a possible pass from O2. It's important that O3 has moved out and taken his defender with him/her. Tap Head Two starts exactly the same as Tap Head One. O2 lateral screens for O1 (diagram D), but this time, instead of rubbing off O5,O1 cuts right down the lane for the pass and lay-up. After screening, O2 rubs off O5 for a possible pass and shot from the right wing (diagram E). This also starts exactly the same as Tap Head One (diagram F). O2 lateral screens for O1, but this time, instead of cutting to the wing, O1 turns and screens for O2 (diagram G). O2 then cuts over the screen and around O5 to the right wing for the pass and shot. After screening, O1 cuts around O4 to the left side (diagram H), and Coach Fratello says that this is often open for the game-winning shot (save this "special" option for the end of the game). 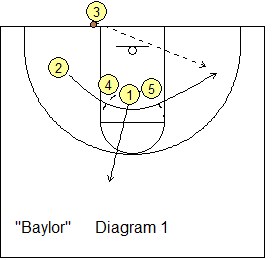 I saw Baylor coach Kim Mulkey run a play similar to this in the NCAA Final game vs Notre Dame. Your best shooter O2 starts on the ballside (diagram 1). O4, O1, and O5 are lined up across the paint. 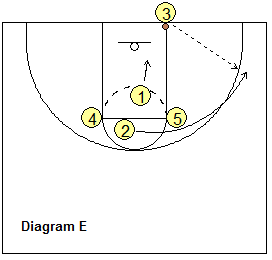 O2 cuts around the triple-screen for the pass and short jump-shot. After O2 cuts, O1 pops out to the top. After running the play a couple times, the defense may cheat and X5 may switch and jump out to defend O2. 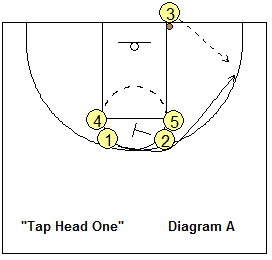 Here, O5 seals and steps in for the quick pass for a lay-up (diagram 2).